31 years after the Chernobyl disaster, the fall out of the accident is still being felt across eastern Europe. Find out how CBC has been able to make a difference in the lives of some of those affected. Natalia is tired but looks on fondly as her only son, Adrian, helps his friends to the entrance of the centre where they gather daily in Chisinau, Republic of Moldova. Adrian moves with some difficulty and his body appears to be that of a young teenager instead of the 28 year old man that he is. 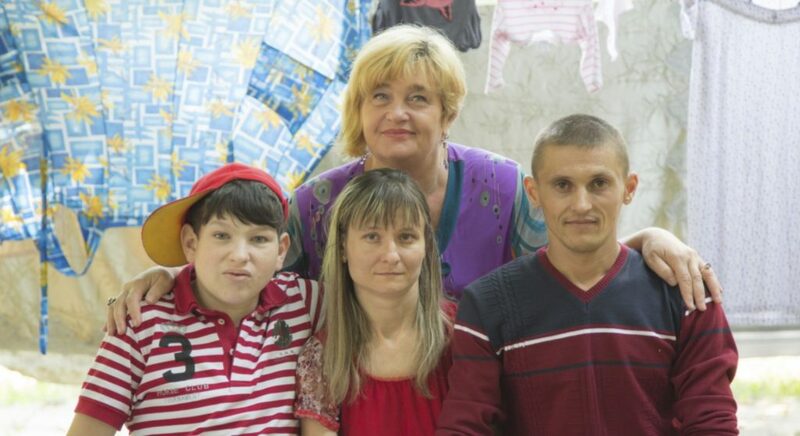 “He is my miracle and this centre is my life, my family now,” Natalia explains with her emotions clearly written across her face. For many years, Natalia had tried unsuccessfully to have a child and was overjoyed to learn that she was pregnant 28 years ago. Shortly after Adrian was born, he was diagnosed with a severe brain tumour and rushed to Germany for emergency treatment and analysis. It was there that doctors discovered the tumour was due to radioactive particles from the Chernobyl disaster in 1986. The hormones that Adrian has to take to prevent the tumour from re-appearing have resulted in his growth and development being stunted meaning that he is now physically handicapped. The centre Natalia refers to is the “Chernobyl Centre”, an NGO that Adrian’s mother founded which develops employment competences of young people that have been directly or indirectly physically or mentally handicapped as a result of the Chernobyl disaster. For example, these young people can learn basic computer skills, book binding and how to create simple crafts at the centre. These products are then sold to generate some income. Initially, it was a struggle to get support for the NGO and, after several years, Natalia began looking to similar initiatives implemented in the neighbouring Romanian region of Iasi. It was in Iasi, that Natalia made contact with Angela, the director of the ADV Foundation. One of the main objectives of the foundation is to equip physically and mentally handicapped young people in the area surrounding Iasi, with the skills needed to enter the labour force. The foundation itself houses several local social enterprises, for example, an archiving centre and a clothing production company. Natalia and Angela quickly realised they had much in common regarding their work and together developed the “Identify the Value” project funded under the Romania-Ukraine-Republic of Moldova ENPI CBC Programme. During the project, the Romanian foundation and Moldovan centre worked together to address the issue of training marginalised groups of young people, which is a challenge in these regions on both sides of the EU’s external border. Angela and Natalia developed their respective centres, exchanged good practices in developing young people’s skills for the labour market and mutual exchanges were held between the young people attending both organisations. Hundreds of other physically and mentally handicapped people have been helped in their daily lives through many projects implemented under the Romania-Ukraine-Republic of Moldova ENPI CBC Programme and this continues under both the Romania-Ukraine and Romania-Republic of Moldova ENI CBC Programmes. Neighbouring regions face the same challenges and by working together they can better address these.